European hub prices exploded higher last week, sending shock waves through the gas market. But the rally had the hallmarks of a classic short squeeze. Last week saw some extreme swings in European gas hub prices. 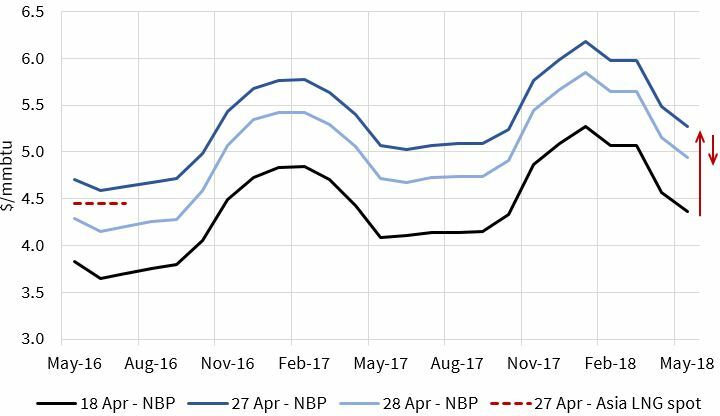 The combination of an early spring cold snap and North Sea supply outages caused the NBP forward curve to explode 20% higher than levels seen the previous week. This move was mirrored across Continental hubs led by the Dutch TTF. But the action was not all one way, with prices plunging 10% in a day last Thursday. Price volatility has returned to European hubs despite the weight of oversupply. The impact of short term supply and demand shocks such as those last week is typically focused in the front of the forward curve e.g. via surging day-ahead and within-month prices. But last week’s moves saw large parallel shifts in prices across the forward curve. That is a characteristic of a classic short squeeze in a market that has been weighed down by strong bearish sentiment since the start of the year. Middle curve (light blue): curve from last Thursday (28th Apr), showing a 10% fall in the front of the curve. Last week’s price surge that culminated on Wednesday was fuelled by unseasonably cold weather in North West Europe. This coincided with production outages on the Norwegian Continental Shelf and an outage at the Easington terminal in the UK. All of these factors are relatively short term in nature. But the chart illustrates a parallel move higher in prices across the forward curve. The transmission mechanism from prompt prices to the front of the curve relates to gas storage dynamics. Last week saw a sharp increase in storage withdrawals to plug the supply gap, in a period where seasonal storage facilities are typically injecting gas in preparation for next winter. Pulling gas out of store means greater volumes need to be purchased for injection across the summer, triggering a rally in summer hub prices. But this is only part of the story. Portfolio positioning is likely to have played a more significant role in the price swings than any fundamental factors. European hub prices have been weighed down since the start of 2016 by lower oil prices, robust production volumes and rising LNG imports. Gas market sentiment (e.g. as measured by Bloomberg) has been consistently bearish. And it is easy to see why against the fundamental backdrop we set out last week. But bearish fundamentals over a two year horizon do not preclude sharp moves higher in the shorter term. One of the practical implications of strong bearish sentiment is that gas portfolios tend to be positioned for further price declines. This may be via trading desks being outright short gas. Or it may relate to portfolio’s being underweight hedge volumes required to meet demand. Either way it leaves the market exposed to sudden shocks to the upside. Last week’s move higher in gas prices also occurred against a backdrop of a similarly unexpected rally in oil prices since the start of April. The combined gas and oil rally is likely to have been partially fuelled by energy trading desks being forced to buy volumes as portfolio risk management limits are breeched (e.g. ‘stop loss’ and ‘VaR’ limits). This can create a self-reinforced surge as the price rally triggers further stop loss buying. These are the classic characteristics of a short squeeze. And this logic is reinforced by the rapid decline in European hub curves that followed last Wednesday’s surge. Stop loss buying is often a short lived phenomenon with prices spiking but leaving a vacuum below. When the self-reinforced buying frenzy subsides, fundamental market drivers reassert themselves. Last week’s price moves illustrate some interesting dynamics with respect to Europe’s role in driving global LNG spot prices. The rally in North West European hub prices over the last two weeks has supported a recovery in Asian spot LNG prices. This has coincided with a re-emergence of short term buying interest from Japan, Taiwan and Argentina, but NBP is the key benchmark pulling cargo prices higher. Last Wednesday’s European price surge saw the unusual phenomena of NBP temporarily trading at a premium to spot LNG prices in Asia and South America. The front month NBP contract closed at 4.70 $/mmbtu on Wednesday, a premium of 0.25 $/mmbtu over spot LNG benchmarks around 4.45 $/mmbtu (as shown on Chart 1). Chart 1 shows how this premium was short lived, with Thursday’s fall reinstating the usual transport cost driven discount of NBP to spot LNG prices. These factors weigh against the chances of a structural recovery in hub prices across the rest of 2016. But the events of the last week have breathed some life back into European gas price volatility. This is a key price signal for the battered value of gas supply flexibility. As 2016 evolves it will be interesting to see if the recovery in volatility is temporary in nature or the start of something more enduring.